17, 18 & 19 July 2015 the 10th anniversary of Night of the Progs. A three day festival this year celebrating the 10th anniversary of what has become a must go to festival for prog fans. For the 10th anniversary WIV entertainment had done their utmost to compile a lineup of outstanding acts. A grand total of 19 acts this year divided over three days. Not all of them established names, still it appears to be a fantastic festival once again. Each year the festival has a camp site nearby where you can set up a tent, set your caravan or mobile home. Every year also brings new surprises for campers. In my seventh year of visiting the festival I can honestly state I have never set up on the same field, not once. This anniversary year was not different. A new place, a lot of campers this year, the biggest campsite yet in 7 years. WIV entertainment and of course its owner and organiser Winifried have outdone themselves. The largest crowd and a lot of security as well, paying Pfand for throwing out your waste after you leave. A good solution for an almost impossible cleaning task afterwards, people tend to be more clean when they have to pay. But enough of that, the review is about the music, not the camp site. For the 8th time in a row I went to the Night of the Prog festival, once again knowing in advance that I would be treated to some excellent performances. Celebrating the 10th anniversary of the festival, organizer Winfried V�lklein had managed to compile a very interesting program divided over 3 days, revisiting bands that already performed at the festival and some new names. The weather gods once again were very generous with the sun beams and almost total lack of rain, so with my sun cream packed and enough water to drink I headed to the festival site. 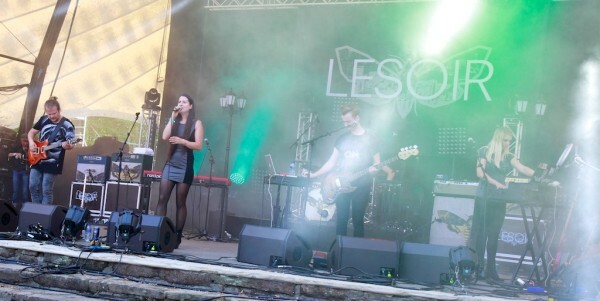 First band of the festival was Lesoir , a Dutch band I myself as Dutchman had never heard of until they were announced for NOTP X. Lesoir is a six piece rockband headed by a lovely talented female singer, a female guitar player- keyboardist and four guys. The music they provided us was on the edge of alternative-rock / prog-rock. Shorter songs, heavy and straight forward. Good stuff to get a crowd warmed up for a long festival. The singer admitted baldly to never having heard of NOTP if it wasn't for her brother bringing it to her attention and now here she was playing with the opening act on the 10th anniversary of the festival. Very proud to be at the festival. I must admit that I enjoyed their set so much that I have bought their CD Luctor et Emergo before going home again.